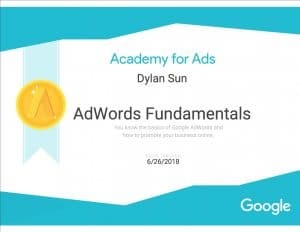 In this comprehensive step-by-step Google Ads (Formally Google AdWords) Fundamentals Certification course, candidates will learn how to create a Google Ads Search and Display advertising campaign from scratch, understand how AdWords works, and how to measure and fine-tune AdWords campaign parameters for optimal results. This course will also prep candidates to take the Google Ads Fundamentals exam with a passing rate of at least 80%. At the end of the two days, candidates will sit for the Google Ads Fundamentals exam in class. The duration of the exam is 90 minutes. Basic computer knowledge. Each participant will be provided a windows laptop and a Google Ads demo account for the duration of the course. Participants may however opt to bring their own laptops. Click on the tabs to expand the content. An ROI driven marketer, Xuanbin ran a cost-efficient and profit-driven programmatic remarketing programme across 6 markets in Asia. Using a mix of Programmatic Display, Paid Social and Telemarketing / Electronic Direct Mailers, he helped build sales pipelines across various business units within SAP in the APJ region. The revamped International Enterprise (IE) Singapore corporate website, which Xuanbin was the co-project lead, saw online engagements increase significantly over the same time period from the previous year — an increase of 30.8% in visits and 59.7% increase in pageviews. The website was awarded Best Customer / User Experience Site Award at the 2013 Sitecore Site of the Year Awards for Asia, and Best in Class (B2B) in the 2014 Interactive Media Awards. 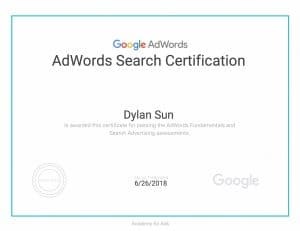 Xuanbin is a certified individual in Google AdWords and Google Analytics. He is also a certified adult educator with the WSQ Advanced Certificate in Training and Assessment (ACTA). In his day job, he is a fully committed data ninja, manipulating and analysing large datasets to uncover the real business impact of the digital campaigns he runs.